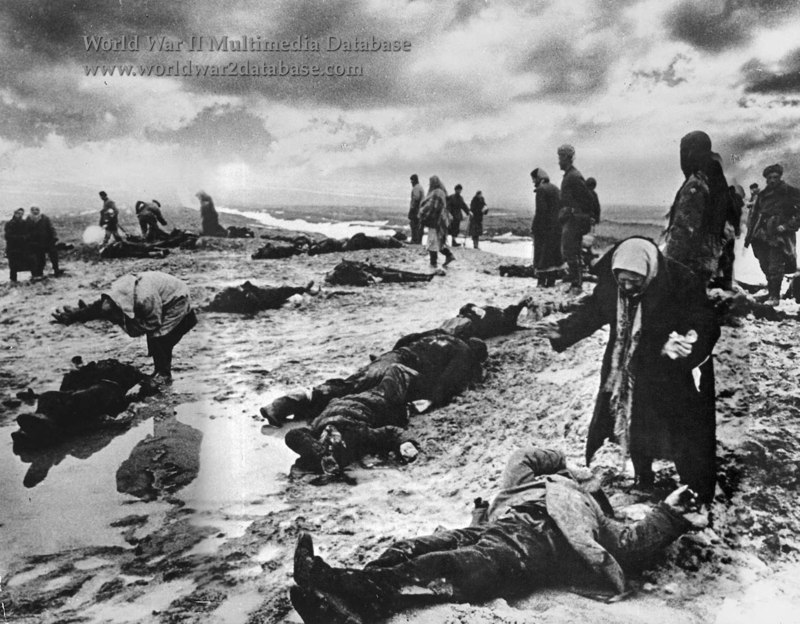 Ukrainian civilians search for their family and friends among the dead, massacred when the Germans and Romanians evacuated Kerch in the Crimea on December 30, 1941. The Germans had first occupied Kerch as they drove on Sevastopol in November 1941. A landing by Marines attached the Soviet 51st Army drove the Germans out. The Marines found thousands of dead civilians, deprived of food and terrorized by the Gestapo during the occupation. Vyacheslav M. Molotov (March 9, 1890 - November 8, 1986) People's Commissar of Foreign Affairs for the Soviet Union, issued a communique on January 7, 1942, listing German atrocities. He told all Allied diplomats worldwide: "According to preliminary figures, about 7,000 persons were killed by the German fascist bandits in Kerch." During the Nuremberg Trials in 1945-1946, Soviet Assistant Prosecutor Colonel Lev N. Smirnov (1912-1986) read statements from Kerch liberators and survivors into the Court record: " After the Germans had been thrown out of Kerch, on 30 December, 1941, Red Army soldiers discovered, in the prison yard, a formless mass of bodies of young girls, naked, mutilated and unrecognisable, who had been savagely and cynically tortured to death by the fascists...As a site for the mass execution, the Hitlerites selected an anti-tank ditch near the village of Baguerovo where for three days on end motor buses brought entire families who had been condemned to death. When the Red Army entered Kerch, in January, 1942, the Baguerovo ditch was investigated. It was discovered that this ditch - 1 kilometer (3,280 feet) in length, 4 meters (13 feet) in width and 2 meters (6.5 feet) in depth - was filled to overflowing with bodies of women, children, old men, and boys and girls in their teens. Near the ditch were frozen pools of blood. Children's caps, toys, ribbons, torn-off buttons, gloves, milk bottles and rubber comforters, small shoes, golloshes together with torn-off hands, feet and other parts of human bodies were lying nearby. Everything was spattered with blood and brains. Twenty-year-old Anatolyi Ignatievich Bondarenko, now a soldier in the Red Army, states: 'When we were brought up to the anti-tank ditch and lined up alongside this fearful grave, we still believed that we had been fetched in order to fill in the ditch with earth or to dig new ones. We did not think we had been brought there to be shot, but when we heard the first shots from the automatic guns trained on us, I realised we were about to be murdered. I immediately hurled myself into the ditch and hid between two corpses...Then, when the Germans went off to dinner, an inhabitant of my village called from the ditch: 'Get up, those of you who are still alive'. I got up and the two of us began to drag out the living from underneath the corpses. I was covered with blood. A light mist hung over the ditch - steam arising from the rapidly congealing mass of dead bodies, from the pools of blood and from the last breath of the dying. We dragged out Theodor Naoumenko and my father, but my father had been killed outright by a dum-dum bullet in the heart. Late at night I reached the house of some friends in the village of Baguerovo and stayed with them until the arrival of the Red Army.' Witness A. Kamenev stated: 'The driver stopped the car behind the aerodrome and we saw Germans shooting people near the ditch. We were dragged out of the car and pushed toward the ditch in batches of ten. My son and I were among the first ten. We reached the ditch. We were lined up facing it and the Germans began their preparations to shoot us in the nape of the neck. My son turned to them and shouted: 'Why are you shooting the peaceful population?' But the shots rang out and my son instantly jumped into the ditch, I threw myself in after him. Dead bodies began to fall upon me in the ditch. About [1500 Hours] an eleven-year-old boy stood up from among the pile of corpses and began to call, 'Little Fathers, those of you who are still alive, get up. The Germans have gone'. I was afraid to do so since - I thought that the boy was shouting by order of the policeman. The boy called out a second time and then my son answered him. He stood up and asked: 'Dad, are you alive?' I could not answer anything and merely nodded. My son and the other boy dragged me out from under the bodies. We saw some others who were still alive and who were shouting 'Help us'. Some were wounded. All the time, while I had been lying in the ditch, under the bodies of the dead, I could hear the shrieks and wails of the women and children. The Germans had started shooting old men, women and children after shooting us.'" Dmitri Baltermants, who took this photo, purposefully overexposed the clouds in the background, which added to the emotional impact. Like much of his other work, it was not published in the Soviet Union until the 1960s; Soviet wartime censors prevented scenes of grief and death from being published during the war.